This is a scalable context timeline. It contains events related to the event (9:00 a.m.-9:24 a.m.) September 11, 2001: Fighters Take Off from Otis Air Base and Begin Training Mission, Unaware of Hijackings and WTC Crashes. You can narrow or broaden the context of this timeline by adjusting the zoom level. The lower the scale, the more relevant the items on average will be, while the higher the scale, the less relevant the items, on average, will be. 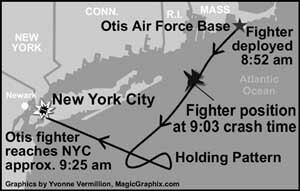 To New York, Then Redirected to Military Airspace - Other accounts will say the Otis fighters initially head toward New York City, but are subsequently redirected to the military airspace off Long Island (see 8:54 a.m.-8:55 a.m. September 11, 2001). According to author Lynn Spencer, after taking off, Duffy and Nash fly “supersonic toward New York for approximately 15 minutes.” But just after the second WTC tower is hit, Duffy suggests to the weapons controller at NEADS that the two fighters head to the Whiskey 105 training airspace off Long Island, and that is where they then go. [Spencer, 2008, pp. 83-85] Tape recordings of the NEADS operations floor will reveal that, at 8:45 a.m., Major Kevin Nasypany, the facility’s mission crew commander, gave Major Fox a coordinate north of New York City, and told him to “Head [the Otis jets] in that direction” (see 8:45 a.m. September 11, 2001). 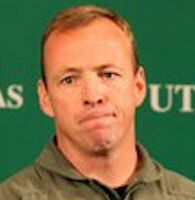 Then, at 8:52, he told one of his staff members, “Send ‘em to New York City still” (see 8:53 a.m. September 11, 2001). 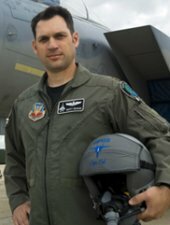 But, according to Vanity Fair, shortly after the second tower is hit, the NEADS weapons technicians get “pushback” from civilian FAA controllers, who are “afraid of fast-moving fighters colliding with a passenger plane,” so the two fighters are directed to a “holding area” just off the coast, near Long Island (see 9:09 a.m.-9:13 a.m. September 11, 2001). [Vanity Fair, 8/1/2006] Accounts are also unclear regarding what speed the Otis jets fly at after taking off (see (8:53 a.m.-9:05 a.m.) September 11, 2001). NEADS Asks Tanker to Support Scrambled Fighters - A member of staff at NEADS now talks over the radio with a member of Maine 85’s crew (presumably one of the pilots), and asks if the plane could provide fuel to the two F-15s that are kept on “alert” at Otis Air Base and that were scrambled in response to Flight 11 (see 8:46 a.m. September 11, 2001). [North American Aerospace Defense Command, 9/11/2001; North American Aerospace Defense Command, 9/11/2001] These fighters are currently flying into Whiskey 105 (see 9:01 a.m. September 11, 2001). [Federal Aviation Administration, 9/11/2001; 9/11 Commission, 2004] The person at NEADS says to Maine 85 that he was “wondering if you’d be able to support a couple of F-l5s currently on an active air.” He adds, “I’d like to park you in Whiskey 105 for a while.” Maine 85 replies, “We’re scheduled for Whiskey 105, sir, with some F-15s.” (This is presumably a reference to the F-15s that are due to fly a training mission in the military airspace this morning.) 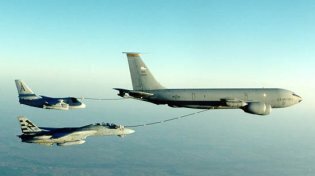 The person at NEADS says that the tanker’s support “would be for a Panta flight currently on an active emergency for us,” referring to the two fighters scrambled in response to Flight 11.